The Football Conference Trust is a recently launched charity, aimed at “Generating Opportunities – Making A Difference.” Weston Super Mare FC Press Officer Alan Brown tells us how it’s helped his club. Good new stories in football rarely grab the headlines. Often it is transfer speculation, tales of bad behaviour and general gossip that fill our back (and sometimes the front) pages. Yet we all know how football can be a force for good. We just need to get better at telling the story. Where does the money go from the top of the game? Re-investing in its communities is central to the Premier League’s business model. A total of £174m was distributed outside of the Premier League in 2011/12 – over 14% of their £1.2bn turnover. The Football Conference is now in receipt of a formal £2m Solidarity agreement, in place for three seasons. Of this annual income, The Football Conference has agreed to invest £800,000 of this sum into their communities each year. This created a unique opportunity: The creation of a charity, The Football Conference Trust, to manage this new funding stream, offering every club support to help grow their community work. The Football Conference Trust is just at the end of its first full season. Each club in the Premier can apply for up to £20,000 as 60% contribution towards a project. In the North and South, the ceiling is lower at £15,000 but the percentage level of support higher at 70%. So far, it has awarded grants totalling £1.45m to 60 clubs for over 90 different projects costing £2.8m. That means that just under £1.4m was attracted into the programme from sources outside football. Projects have ranged from arts activities, volunteering, work with young people not in education or training (NEETs), disability sport teams, creating educational initiatives, working with isolated community groups, green projects, healthy eating and lifestyle, support for existing community programmes, and working in partnership with schools to deliver football coaching. 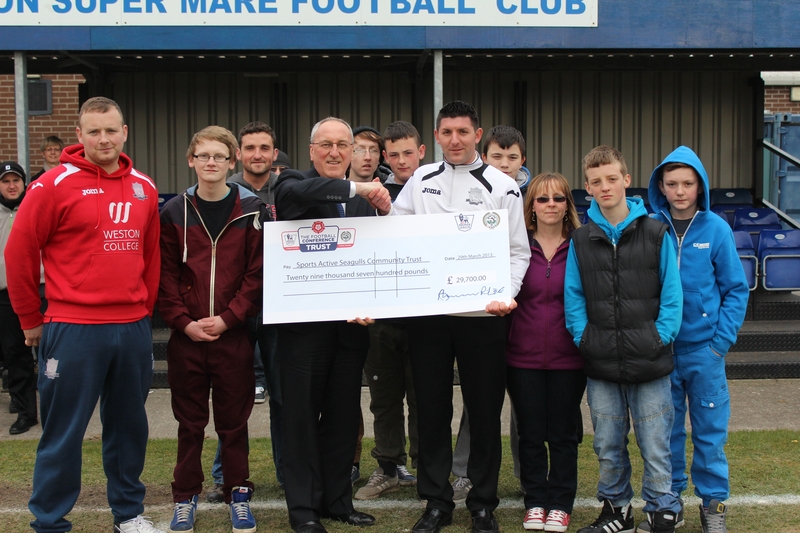 Here at Weston Super Mare, we have used grant aid to set up a youth club which is based at the Football Club. The youth club provides a safe and inspiring environment for young people to meet and actively take part in sporting activities. At a time when many of the Youth Services are struggling we have been able to offer the opportunity for young people to come along on a Monday and Thursday evening and attend a club which they can feel part of and develop team building and social skills. At our game against Farnborough, we were pleased to welcome Dennis Strudwick, General Manager of the Football Conference, who presented a cheque for £29,700 on behalf of the Trust, representing the grant aid that the Sports Active Seagulls Community Trust has been offered to fund our community youth club and age-group football programme. The fund has allowed us not only as a Community Trust but also as a Football Club to engage closely with our local community and help develop exciting opportunities for the young people, through attendance at the Youth Club and establishing links with local and national organisations to offer the chance to improve life skills and qualifications. The Youth Club has also provided voluntary and part time work for members of the local Community and as the Trust develops it is hoped that these opportunities will only increase further. This money comes freely to the competition from the top of the game, because the Premier League and the PFA recognise the role Football Conference clubs play in their communities. Whatever the result today, let’s celebrate that good news. Many thanks to Alan for this insight. To find out more on Weston-Super-Mare FC, visit their website or follow them on twitter. Posted on April 6, 2013, in UTL Archive and tagged Charity, Football Conference Trust, Weston-Super-Mare FC. Bookmark the permalink. Leave a comment.